The creation of my latest book, ‘UFO: the Search for Truth’, has been an immense learning curve for me personally. My experience so far has been as a published writer connected with mythology, native Pagan legend/religion and the eco-system and more recently concerning the deception within politics. UFO: the Search for Truth holds numerous accounts of strange public sightings concerning UFOs and aliens. The subject of poltergeists and other extraordinary phenomena is also broached as being relevant to the subject at hand. However, just before I finalised the book fate stepped in and an amazing disclosure occurred. I was contacted by the proprietor, Mr Chris Bray, of a well-established Leeds bookshop, The Sorcerer’s Apprentice. Chris was aware that I was writing UFO and he kindly wanted to grant me permission to use an image from his private collection. Just before the book went into print I rushed in to request from my publishers, ‘CanWriteWillWrite’, that we should include this late disclosure. The old photograph Chris sent to me was astonishing as it seemed to fit perfectly with what I had already written concerning the potential of our Humalien heritage. I had already included in the book American data from the Starchild Project – an established scientific operation run by Lloyd Pye. Recent tests on an extraordinary ancient skull of a child had revealed that one of the parents of the child in question possessed DNA that was not recognised as being of human origin. The potential of our Humalien heritage was being revealed. Lloyd reiterates that scientific corroboration now clearly illustrates that a “significant part of the Starchild’s genome is not found on Earth.” This groundbreaking discovery by Lloyd’s expert team will indeed I believe transform world history and the way we perceive life in the universe. However, the new photo that came to light, thanks to Chris Bray, threw a whole new light on the exciting issue of humans who had indeed crossbred with extraterrestrial races. In June 1908 The Tunguska Event, or Tunguska Explosion, was a powerful explosion that occurred over the so-called Southern swamp, a small morass not far from the Podkamennaya (Lower Stony) Tunguska River in what is now Krasnoyarsk Krai of Russia. There was not I believe a great deal of scientific interest about the impact at the time, possibly due to the remoteness of the Tunguska region. The first recorded expedition arrived at the impact site more than a decade after the event. In 1921, the Russian mineralogist Leonid Kulik, visiting the Tunguska River basin as part of a study for the Soviet Academy of Sciences, deduced from neighbourhood accounts that the explosion had been caused by a giant meteorite impact. Kulik, persuaded the Soviet government to finance an expedition to the Tunguska region, based on the prospect of meteoric iron that could be salvaged to support Soviet industry. Kulik’s party finally undertook an expedition in 1927. Kulik made arrangements with the local Evenki hunters to direct his party to the crash site. Reaching the vicinity was an extremely difficult task. But upon reaching an area just south of the location, the superstitious Evenki hunters would go no further, fearing what they called the “Valleymen”. Kulik was therefore impelled to return to the nearby village, and his party was delayed for several days while they sought new guides. Who were the mysterious Valleymen that struck fear into the hearts of the Evenki hunters? Did they have any relationship to the Tunguska Explosion? Later on, other claims came in about a wreck of an alien device that had been found at the site of the inexplicable explosion. Reports indicated that Russian scientists, belonging to the Tunguska space phenomenon public state fund, said they found the remains of an extra-terrestrial apparatus that allegedly crashed near the Tunguska River in Siberia in 1908. The mystery of the Tunguska event continues, yet now we have the Siberian mother and child issue to consider also. I must say here that the more I personally discover about this particular subject the more I am convinced that extraterrestrial intervention with our own race has genuinely occurred before. The evidence of experts does appear to be most compelling indeed. Chris’s pioneering disclosure deserves great credit. His “humaliens” theory in fact makes excellent sense and would perhaps form the basis of a brand new investigation for scientists researching DNA, such as the one headed by Lloyd Pye. I feel this situation alone merits greater research than is being currently undertaken. Are we finally witnessing evidence of genetic amalgamation between extraterrestrial life forms with humans? Since ancient times up to this day; inexplicable UFOs have indeed been reported over Siberian and Russian areas. I welcome greater scientific investigation into this exciting situation. Others also seem to be suggesting similar. Alternatively, recent sensationalistic scare-mongering by others such as top scientist Stephen Hawking, who warned us in April not to ‘talk with aliens,’ appears to be unjustified in view of the disclosure highlighted in this article. The physical characteristics of the woman and her child seems to be very weak evidence to me. I’ve known people during my five plus decades of life that show the same traits. You have to do better than that to convince me of the Star Trek version of alien life. But I do endorse Lloyd Pye’s research of the Star Child Skull. Physical evidence is the only way to convince the powers that be of the possibility of intelligent life that might not be human. So dude – you ever contemplated that the “people” you know who are similar may have extraterrestrial parentage? That seems logical to me. Sometimes the simplest explanation is the correct one, even if modern science has not caught up or does not like to face the truth. Sorry dude, it’s going to take more than long skinny hands ands fingers on some folks to convince me of ‘alien’ parentage. Maybe if they found the tribe and took some DNA samples, then we’d be in business! That which mankind calls Alien, is that which does not conform to the norm, hence mankind severely restricts himself, because as he is not prepared to have what many call an open mind. For-instance I left school-aged fourteen applied for job in an Electronics Company by written letter. The letter stated I was seeking employment in the Electronics Industry, I was bored with school as was building miniature electronic Gizmos in my spare time. They sent a letter by hand for a Job interview. They asked to see some of the Gismos after seeing what they could do I was offered a job in their R&D laboratory at Gardeners Radio Somerford. Shortly after being there some few months I reformulated the Araldite used to cover and protect so that it had a mirror shine plus 33 to 35% increase in resistance. The first time this new formula was used is was for 24 Chokes that were part of the control system for a Nuclear Submarine. Those who had gone through the formal process of School then College then University to gain their Masters Degrees were very upset that someone with no formal training could do such a thing. That was just the beginning. Since then I formulated the control program for the ‘Worlds First Communications High Capacity Super Controller & System’. In your Worlds closed circuit minds you might think I was an Alien. Remember how those who had knowledge of Herbal medicines were hunted down and burnt as ‘Witches’ how very primitive man-kind still is? Congratulations on your accomplishments Carl, I wish I had your drive and intelligence. Inventing and running your own business are nothing to sneeze at! That said, extraordinary human intelligence is nothing new, just rare statistically. Human/alien hybrids would not be a natural occurrence IMHO, some kind of science would have to be involved and be traceable, as in Pye’s Star Child Skull. Dude, admit it: you’re an alien. Your technology is well beyond anything we’ve got. I agree, dad2059: it’s pretty desperate evidence. North Asian/Inuit traits are alien for what reason? Because they’re not caucasian or black? Long fingers are alien for what reason? Because most women have small hands? Why not go the whole hog? Greys are bipeds and humans are the only truly bipedal apes, therefore Greys banged the missing link. QED. But lets give them what they want and accept that this is an unusual woman. I would ask Regan: So, one picture? If humans have an alien heritage, shouldn’t we see a lot more of this expressed? After all, that is her baby, right? She did pass on those genes at least once. The article talks about future research into alien DNA. Aren’t they aware that for the last decade or so, scientists have been sampling populations worldwide and using m-DNA to map the relatedness of far-flung ethnic groups and reconstruct their migration over tens of thousands of years? Alien m-DNA would stick out for its marked … alien-ness. Don’t these people know anything about science findings and scientific ways of thinking? Well, there you go: an established scientific operation that is hostile to the way established science operates. The Human DNA Project would be an excellent example of how something alien would be found. I’m not sure if anything anomalous was ever found in the tested groups, but would the scientists (or their bosses) allow anything strange leaked into the media? I’m not so sure they would. That said, the Star Child Project is an independent project funded solely by Pye and where/whoever contributes the funds. It’s been shown at the molecular level that the father of the Child is anomalous. As I suggested to a previous commenter Arnold, that would be an excellent idea. But as it was pointed out, the Human DNA Project went into a lot of isolated areas and tested some of these tribes. So far, nothing strange was found. But that doesn’t mean nothing wasn’t. Without having researched more into the photo yet, I’d say that up front while the image is old, here is some ‘smearing’ that gives the impression that the photo, while it may have been an actual photo, has been altered – especially around the child’s face. This may not be the case, since early film and development provided less than stellar, detailed photographs. Regardless, as I mentioned on Tina Sena’s site, I think this photo, is certainly evidence of something: Humans f*cking humans. I think that DNA testing of some isolated races that display “alien” trait is a very good idea and I have no problems with that. Alternatively, I think being closed-minded smacks of insecurity, limited intellect and a desire to destroy any research initiative for privately held malicious motives (i.e. wind-up merchants that like to flame others for their sad little jollies). And Arnold is spot on about SETI – get looking down here folks, rather than just in the skies. As he also says – “scientific materialists” will go to any lengths to avoid what they see with their own eyes. 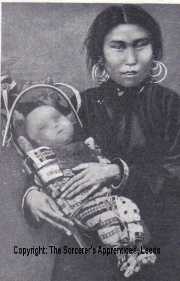 The ‘Alien Mom’ photo looks genuine to me and explains a lot of questions about our ancient non-human heritage I feel. I think it is an interesting story, but if she is of alien descent based on that picture then so am I. I’m 5’5″ and have been teased my whole life for my freakishly long hands. Seriously my hands are scary- the only person in my life whose hands are longer then mine in length is 6’5″ tall man. I also have extremely high cheekbones, I’ve been told they were recessive from my Native American blood (note I’m a pale-skinned green eyed, brown-haired girl.) I don’t look Native at all except for my high cheekbones. Coincidentally my 6 year old son has long fingers and my daughter has high-cheekbones. Because my son has autism we have all had genetic testing done and I’m sad to report we are all human. I believe in aliens –but this is one of those pics I just don’t think is that extraordinary. can low blood sugar curse back pain and how to put an end to waist pain. i have one question with the Tunguska event and the Evenki tribesmen what or who were the valley men and why did these hunters fear them my guess would be the extraterrestrial race or races that landed if they landed not trying to slam the idea i agree fully may not have had enough time to land and therefore created the loud bangs and explosions in the sky and what i read on another website and i quote Testimony of Chuchan of Shanyagir tribe, as recorded by I.M. Suslov in 1926. Interesting story. Not too many local eyewitness accounts survive the 1908 Tunguska event. Whether they have a link to the humalien mystery will probably be never known. i wonder if the humaliens are related to the kecksburg incident or the German wunderwaffe which was an aircraft Hitler tried a lot of different things.